The 2017 M2 Rescue features the iconic two-tone crown of the M Metalwoods Family and new innovative performance technologies, creating a versatile Rescue club with exceptional sound and feel. The sole of the club houses a longer, more flexible Speed Pocket, which offers speed and forgiveness on low-face strikes. Geocoustic technology further improves the club's performance through advanced geometry and sound engineering. 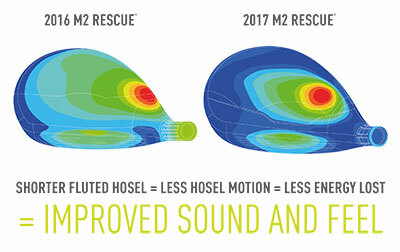 The shaping of M2 Rescue includes a two-tiered sole to promote added playability from a variety of lies. The new sole design and a short, fluted hosel also work in tandem to optimize sound and feel at impact while lowering the CG.